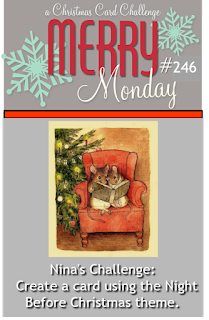 Merry Monday challenge #246 was centered around the 'Twas the Night Before Christmas theme. Being a francophone, I have a vague notion of what this story is, but I had to go look up the exact wording of it to see which card it could inspire. I had quite a few ideas that came up, but the one that stuck was the idea of the window. I bought the Hearth & Home Framelits when they came out and have not used them nearly enough so far, and the idea of doing a starry Christmas sky also allowed for the possibility to pull out my Distress Oxide inks, another tool I want to play around with more. The window seemed like a good opportunity to pair with the Brick Wall stencil and Grit Paste as well. The card background was stamped with the Snowfall Background from My Favorite Things and embossed with Opalescent embossing powder, which looks really great against the navy background. I was almost disappointed that we didn't see more of the beautiful sky background I had created once it was cut to size for the window, so I got ambitious and decided to make my own matching envelope, using a piece of thin white cardstock and the Envelope Punch Board. It took a while to get it all inked (maybe because it was cheaper cardstock and the ink was not blending on it as well as it would have on nicer cardstock), but once I finally got a nice coverage and I spritzed it with water, it came to life in a lovely way. I'm thinking anyone would get excited to find such a pretty envelope amongst their mail. I used navy embossing powder for the Santa sleigh and the house to make the image stand out more against the inked background. The design was inspired by past Mojo Monday sketch #384 and the colours by ColourQ challenge #49.